For the tar pit in La Brea, Trinidad and Tobago, see Pitch Lake. The tar pits visible today are actually from human excavation. The lake pit was originally an asphalt mine. The other pits visible today were produced between 1913 and 1915, when over 100 pits were excavated in search of large mammal bones. Various combinations of asphaltum, dust, leaves and water have since filled in these holes. Normally, the asphalt appears in vents, hardening as it oozes out, to form stubby mounds. These can be seen in several areas of the park. This seepage has been happening for tens of thousands of years. From time to time, the asphalt would form a deposit thick enough to trap animals, and the surface would be covered with layers of water, dust, or leaves. Animals would wander in, become trapped, and eventually die. Predators would enter to eat the trapped animals and also become stuck. As the bones of dead animals sink into the asphalt, it soaks into them, turning them a dark-brown or black color. Lighter fractions of petroleum evaporate from the asphalt, leaving a more solid substance, which encases the bones. Dramatic fossils of large mammals have been extricated from the tar, but the asphalt also preserves microfossils: wood and plant remnants, rodent bones, insects, mollusks, dust, seeds, leaves, and even pollen grains. Examples of some of these are on display in the George C. Page museum. Radiometric dating of preserved wood and bones has given an age of 38,000 years for the oldest known material from the La Brea seeps. The pits still ensnare organisms today, so most of the pits are fenced to protect humans and animals. While crossing the basin the scouts reported having seen some geysers of tar issuing from the ground like springs; it boils up molten, and the water runs to one side and the tar to the other. The scouts reported that they had come across many of these springs and had seen large swamps of them, enough, they said, to caulk many vessels. We were not so lucky ourselves as to see these tar geysers, much though we wished it; as it was some distance out of the way we were to take, the Governor [Portolá] did not want us to go past them. We christened them Los Volcanes de Brea [the Tar Volcanoes]. Harrison Rogers, who accompanied Jedediah Smith on his 1826 expedition to California, was shown a piece of the solidified asphalt while at Mission San Gabriel, and noted in his journal that "The Citizens of the Country make great use of it to pitch the roofs of their houses". 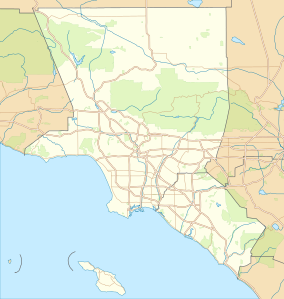 The La Brea Tar Pits and Hancock Park are situated within what was once the Mexican land grant of Rancho La Brea, now part of urban Los Angeles in the Miracle Mile district. For some years, tar-covered bones were found on the Rancho La Brea property but were not initially recognized as fossils because the ranch had lost various animals–including horses, cattle, dogs, and even camels–whose bones closely resemble several of the fossil species. The original Rancho La Brea land grant stipulated that the tar pits be open to the public for the use of the local Pueblo. Initially, they mistook the bones in the pits for the remains of pronghorn antelope (Antilocapra americana) or cattle that had become mired. Union Oil geologist W. W. Orcutt is credited, in 1901, with first recognizing that fossilized prehistoric animal bones were preserved in pools of asphalt on the Hancock Ranch. In commemoration of Orcutt's initial discovery, paleontologists named the La Brea coyote (Canis latrans orcutti) in his honor. Contemporary excavations of the bones started in 1913–1915. In the 1940s and 1950s, public excitement was generated by the preparation of previously recovered large mammal bones. Subsequent study demonstrated the fossil vertebrate material was well preserved, with little evidence of bacterial degradation of bone protein. They were believed to be from the last glacial period, believed to be about 30,000 years ago. After radiocarbon dating redated the last glacial period as still occurring 11 to 12,000 years ago, the fossils were redated to be 10–20,000 years old. Methane gas escapes from the tar pits, causing bubbles that make the asphalt appear to boil. Asphalt and methane appear under surrounding buildings and require special operations for removal to prevent the weakening of building foundations. In 2007, researchers from UC Riverside discovered that the bubbles were caused by hardy forms of bacteria embedded in the natural asphalt. After consuming petroleum, the bacteria release methane. Around 200 to 300 species of bacteria were newly discovered here. The George C. Page Museum of La Brea Discoveries, part of the Natural History Museum of Los Angeles County, was built next to the tar pits in Hancock Park on Wilshire Boulevard. Construction began in 1975, and the museum opened to the public in 1977. 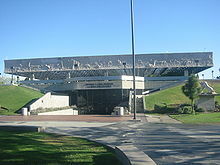 However, the history of the fossil museum really began in 1913 when George Allan Hancock, the owner of Rancho La Brea, granted the Natural History Museum of Los Angeles County exclusive excavation rights at the Tar Pits for two years. In those two years the Museum was able to extract 750,000 specimens at 96 sites guaranteeing that a large collection of fossils would remain consolidated and available to the community. 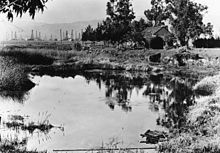 Then in 1924 Hancock donated 23 acres to LA County with the stipulation that the county provide for the preservation of the park and the exhibition of fossils found there. The Museum tells the story of the tar pits and presents specimens excavated from them. Visitors can walk around the park and see the tar pits. On the grounds of the park are life-size models of prehistoric animals in or near the tar pits. Of more than 100 pits, only Pit 91 is still regularly excavated by researchers and can be seen at the Pit 91 viewing station. In addition to Pit 91 there is one other ongoing excavation called "Project 23". Paleontologists supervise and direct the work of volunteers at both sites. On February 18, 2009, George C. Page Museum formally announced the 2006 discovery of 16 fossil deposits which had been removed from the ground during the construction of an underground parking garage for the Los Angeles County Museum of Art next to the tar pits. Among the finds are remains of a saber-toothed cat, dire wolves, bison, horses, a giant ground sloth, turtles, snails, clams, millipedes, fish, gophers, and an American lion. Also discovered is a nearly intact mammoth skeleton, nicknamed Zed; the only pieces missing are a rear leg, a vertebra and the top of its skull, which was sheared off by construction equipment in preparation to build the parking structure. These fossils were packaged in boxes at the construction site and moved to a compound behind Pit 91, on Page Museum property so that construction could continue. Twenty-three large accumulations of tar and specimens were taken to the Page Museum. These deposits are worked on under the name "Project 23". As work for the public transit Metro Purple Line is extended, museum researchers know more tar pits will be uncovered, for example near the intersection of Wilshire and Curson. In an exploratory subway dig in 2014 on the Miracle Mile, prehistoric objects unearthed included geoducks, sand dollars and a 10-foot limb from a pine tree, of a type now found in central California's woodlands. 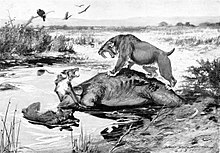 Among the prehistoric species associated with the La Brea Tar Pits are Pleistocene mammoths, dire wolves, short-faced bears, ground sloths, and the state fossil of California, the saber-toothed cat (Smilodon fatalis). Only one human has been found, a partial skeleton of the La Brea Woman dated to approximately 10,000 calendar years (c. 9,000 radiocarbon years) BP, who was 17 to 25 years old at death and found associated with remains of a domestic dog, and so was interpreted to have been ceremonially interred. John C. Merriam of the University of California led much of the early work in identifying species in the early 20th century. The park is known for producing myriad mammal fossils dating from the last glacial period. While mammal fossils generate significant interest, other fossils, including fossilized insects and plants, and even pollen grains, are also valued. These fossils help define a picture of what is thought to have been a cooler, moister climate in the Los Angeles basin during the glacial age. Among these fossils are microfossils, which are retrieved from a matrix of asphalt and sandy clay by washing with a solvent to remove the petroleum, then picking through the remains under a high-powered lens. Tar pits around the world are unusual in accumulating more predators than prey. The reason for this is unknown, but one theory is that a large prey animal would die or become stuck in a tar pit, attracting predators across long distances. This predator trap would catch predators along with their prey. Another theory is that dire wolves and their prey may have been trapped during a hunt. Since modern wolves hunt in packs, each prey animal could take several wolves with it. The same may also hold true of the saber-toothed cat (Smilodon fatalis) known from the area. Movies filmed and Video Game at the La Brea Tar Pits include Volcano, My Girl 2, Miracle Mile, L.A. Noire,Last Action Hero, and Seven Psychopaths. ^ "Hancock Park". Office of Historic Preservation, California State Parks. Retrieved 2012-10-07. ^ Khilyuk, Leonid F.; Chilingar, George V. (2000). Gas migration: events preceding earthquakes. Gulf Professional Publishing. p. 389. ISBN 0-88415-430-0. ^ Kielbasa, John R. (1998). "Rancho La Brea". Historic Adobes of Los Angeles County. Pittsburg: Dorrance Publishing Co. ISBN 0-8059-4172-X. .
^ Orcutt Ranch Horticultural Center Rancho Sombra del Roble. Los Angeles Historic-Cultural Monument # 31. ^ "Animal Bones 50,000 Years Old Found In Tar". Los Angeles Times. Los Angeles. June 17, 1946. Retrieved January 27, 2010. ^ McMenamin, M.A.S. ; et al. (1982). "Amino acid geochemistry of fossil bones from the Rancho La Brea Asphalt Deposit, California". Quaternary Research. 18 (2): 174–83. doi:10.1016/0033-5894(82)90068-0. 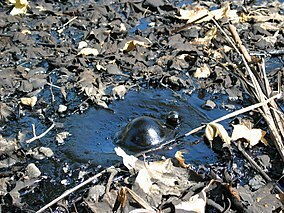 ^ Jia-Rui Chong, "Researchers learn why tar pits are bubbly", Los Angeles Times, May 14, 2007. ^ Page Museum. "About the museum". Page Museum web site. The Natural History Museum of Los Angeles County Foundation. Retrieved January 25, 2016. ^ Page Museum. "Page Museum—La Brea Tar Pits". Page Museum web site. The Natural History Museum of Los Angeles County Foundation. Retrieved December 15, 2006. ^ a b c "Cache Of Ice Age Fossils Found Near Tar Pits". Los Angeles: KCBS-TV. Associated Press. February 18, 2009. Archived from the original on February 20, 2009. Retrieved February 18, 2009. ^ a b Thomas H. Maugh II (February 18, 2009). "Major cache of fossils unearthed in L.A." Los Angeles Times. Los Angeles. Retrieved February 18, 2009. ^ "Workers Unearth Mammoth Discovery near La Brea Tar Pits". Los Angeles: KTLA. February 18, 2009. Retrieved February 18, 2009. ^ "Nearly intact mammoth found at L.A. construction site". USA Today. February 18, 2009. Retrieved September 1, 2010. ^ Malkin, Bonnie (March 7, 2014). "Prehistoric objects unearthed in LA subway dig". The Telegraph (UK). AP. Retrieved March 18, 2014. ^ Jena Ardell. "Why the La Brea Tar Pits Are The Pits". LAWeekly, December 30, 2011. 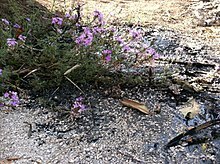 Wikimedia Commons has media related to La Brea Tar Pits. UCMP Berkeley website: describes the geology and paleontology of the asphalt seeps. Gocalifornia.com: La Brea Tar Pits – visitor guide. Palaeo.uk: "Setting the La Brea site in context."